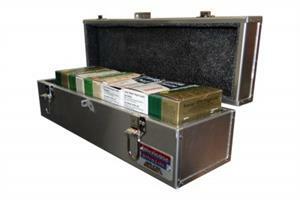 This lightweight yet rugged ammo case meets all air travel regulations. Features include two key lockable latches, additional padlockable eyelets, a low profile strap handle, and an interior padded with hard foam. This is the case to use for carrying ammo, spotting scopes, cleaning supplies, and any additional shooter supplies. Interior Dimensions: 17-1/8" x 4-3/4" x 4-1/4"
Exterior Dimensions: 18-1/4" x 5-1/2" x 5-3/4"